« What’s That Word Again? Hi everyone! Thanks for stopping by the GWN blog. Today Gordon Rothwell talks about the story that was fifty years in the making. I have always been a fast writer. When I was a Creative Director and copywriter for various advertising agencies in San Francisco and Silicon Valley years ago I was asked to come up with ideas fast. To think on my feet. And try out ideas from every kind of angle. I often got my best concepts standing in the shower, with hot water blasting the back of my neck. And I made certain to always keep a pad and pencil handy on a table next to my bed, just in case I came up with a winning idea my sub-conscious supplied when I was fast asleep. But some ideas or stories take a long time to develop. Take that bullfighting tale of mine, for instance. 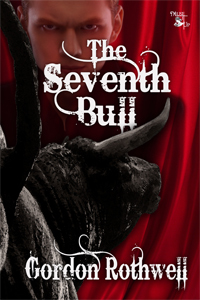 It’s called The Seventh Bull, and it was just recently introduced by MuseItUp Publishing in Canada. That idea took a long, slow time to happen. “Ole΄! Ole΄! Ole΄!” as Power taunted the beast and spun away like a ballet dancer. That film was 20th Century Fox’s Blood and Sand. Watching it really hooked me. And it led to my becoming a lifelong bullfight aficionado. Over the ensuing years, I kept developing my interest in bullfighting. I collected numerous works about it by such writers at Ernest Hemingway and Kenneth Tynan. I stuffed plenty of cardboard boxes to the brim with magazine tear sheets about bullfighting, photographs, and articles like actual banderillas (those long wooden sticks with colorful paper ribbons and a barbed steel point). Soon after my marriage in the mid-1950’s I was drafted into the American Army and sent to France. While on leave there my wife and I attended our first live bullfight in Barcelona. It turned out to be far more exciting “live” than the way it was portrayed in any film or a book. Images and thoughts about bullfighting stirred in my brain then, but nothing actually took solid shape. It wasn’t until 1960 that something happened that got me to thinking seriously about writing a bullfight story. I was working in Los Angeles at North American Aviation, doing public relations brochures and articles on the Apollo Moon Mission Program. A fellow writer, who was a big bullfight fan, told me a major event was about to take place to the south in Tijuana. Antonio Ordoñez, the number one matador in the world at that time, was going to make his first appearance outside of Spain. Ordoñez had been featured in a three-part article in LIFE Magazine written by Ernest Hemingway. The article told about a mano-a-mano duel between Ordoñez and Luis Dominguin, a darling of the press and Ava Gardner’s current beau. A group of us from the aircraft factory went down to Tijuana. That experience proved to be surreal. Especially the partying at the local Sierra Motel. It offered some unforgettable sights. There were beautiful women in skin-tight toreador clothing and flat-brimmed gaucho hats clapping and dancing to flamenco music provided by a small mariachi band. Laughing and chatting movie stars like Mike Connors of MANNIX on TV, Diane Baker and Cesar Romero sat at tables around a dance floor. And a smiling Gilbert Roland, with white sleeves rolled up and a leather sheath on one forearm, beguiled a legion of female fans with outrageous bullfight tales. Much of that dramatic scene made its way into my short story, The Seventh Bull, over fifty years later. Writing is a funny process. Here I am, an advertising copywriter who made my career out of fast thinking and snappy headlines for over 20 years in the San Francisco Bay area, taking half a century to produce one exciting bullfight tale. Robert Dunne, a once respected journalist, is now a drunken hanger-on following a famous bullfighter on tour. Paco Garcia’s fans call him “The Matador Who Can’t Be Killed.” Robert hopes to get on the bestseller list with a book that will reveal the mystery of Paco’s ability to avoid “death in the afternoon. In Tijuana, Paco fires his beautiful agent, Dolores, despite her warnings. In a dramatic bullfight, Paco cheats death yet again and thrills the crowd. But at a party after the fight, the matador drunkenly falls off a high diving board and breaks his neck. Robert suspects foul play by the agent. When he confronts Dolores, she seduces him with promises of fame—but is he willing to pay the price? He’s also a sportswriter and screenwriter, and many of his screenplays have won and been finalists in the Motion Picture Academy’s Nicholl, Acclaim, Chesterfield, Hollywood Symposium, and FADE IN competitions. 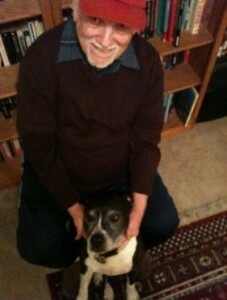 He’s published articles and stories in numerous men’s magazines as well as youth-oriented publications like BOY’S LIFE. He enjoys the fanciful and macabre on screen and in books. Gordon now lives in the shadow of Mt. Shasta, surrounded by a loving family and one sweet pit bull named “Dreamer.” Mr. Rothwell’s blog address is http://olddognewtricksblog.wordpress.com. And he can be contacted as Gordon_Rothwell on Twitter. Find his story here: Muse It Up, Amazon, Kobo, Barnes and Noble. That’s quite some journey, truly inspirational for sticking power. It certainly gives hope.